Note: The technical information provided below is provided for legacy information only. Symantec WinFax PRO 10 is the last version of WinFax to be released, it comes in five different revisions, 10.0, 10.01, 10.02, 10.03 and 10.04 (often incorrectly called 10.4). Our WinFax Tools application (click the WinFax Info button) can tell you immediately the version you have installed, but if you don’t have the product installed, you have to manually check for files on your CD or look at the product box. More details below. 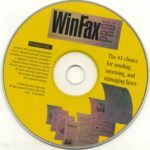 The following information will help you determine the version of WinFax PRO you have installed or have on a CD/install image. Click About Message Manager. 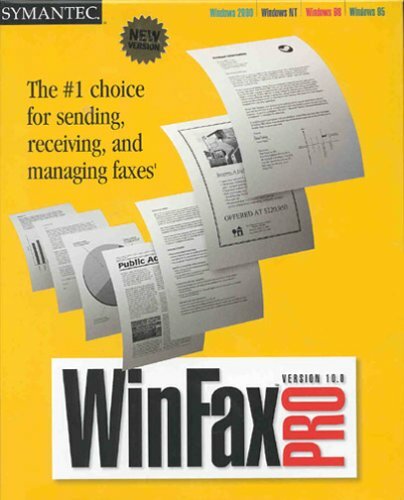 The “About WinFax Pro” box appears. Click the General tab. The version is at the top on that tab. WinFax PRO 10.0 – released February 2000, prior to the official release of Windows XP, but will install with Windows XP. Problems with Office 2003. If your CD or software box looks like the one above, you have 10.0 or in some rare cases a 10.01 installation CD. You can also determine version information by checking the dates of the files stored on the CD in the WinFax folder. The files located in the WinFax folder will have February 2000 and earlier dates. A 10.01 version may have November – December 2000 or January 2001 dates. 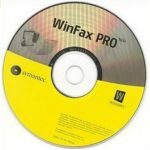 WinFax PRO 10.01 – A patch file for 10.0 that was also released for a limited time as a CD install. Fixed a few bugs, and added Microsoft Windows Me Certification. The only major change was for email forwarding from a self-extracting fax viewer in .exe format to a multi page fax .fxm format. Increases of viruses being sent as .exe attachments caused many to block the sending of .exe files, so Symantec was forced to change the file format to the native .fxm file. A mini-viewer was made available for free to allow viewing of fxm, fxs, and fxr type WinFax files for those who did not have WinFax installed. An 10.01 update file exists, but it is no longer available via Symantec’s LiveUpdate. This version was released in late December 2000, early January 2001. This update was pulled immediately after it was found that when it was applied to a trial version, it would fully activate the software. 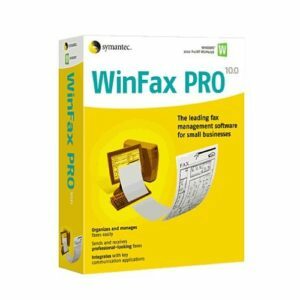 WinFax PRO 10.02 – Officially released as a Windows XP compatible version. Symantec added code in the setup process to detect the installation under Windows XP, and if detected, it installed a new version of the WinFax Controller. This was modified to support an additional WinFax application called “wfxswtch.exe”. This application handled the “Fast user switching” option in Windows XP and it’s always required with Windows XP installs. There are problems with Office 2003 integration, problems with security settings in Word Macros, a Software Development Kit (SDK) problem under Windows XP that causes application link failures with third-party software (Merge faxing with Microsoft Word, ACT! etc.). There is No Symantec LiveUpdate, or update patch file to this version. This version was released Fall 2001. The core group of WinFax technicians and engineers either left the company or were laid-off by this time. 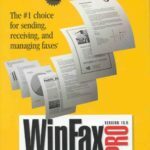 WinFax PRO 10.03 – released to fix the 10.02 SDK problem with Windows XP and some minor fixes that were related to macros and Concord Internet Fax. There is no Symantec LiveUpdate, or update patch to this version. Symantec offered this update at no charge to those who contacted support and had problems encountered with version 10.02. They no longer offer this upgrade. This version was released late 2002, early 2003. If your CD looks like this, you may have a version 10.02 or 10.03 installation CD. You can also determine version information by checking the dates of the files stored on the CD in the WinFax folder. September 2001 and earlier dates on the CD indicate a 10.02 version. November 2002 and earlier dates indicate a 10.03 version. An official 10.04 version CD does not exist. WinFax PRO 10.04 (released as a file update from version 10.03 only, the update only fixes some of the security settings in Windows XP for use with Fax Sharing) Not recommended as an update unless you are using Fax Sharing. If you do not use Fax Sharing, do not update, and do not update from any other version except 10.03 (English). There is No LiveUpdate to this version, a patch file is still available for download from Symantec’s Web site. This update file was released sometime in 2005 in response to the release of Microsoft Windows XP Service Pack 2. Counterfeit CDs: Many counterfeit CDs of WinFax PRO 10 were produced. Some were commercially made and some were obvious home CD printer knock-offs. Many counterfeit CDs contained some sort of physical printing error or CD content errors (mismatched files from various versions, or updates included on the CD when they were normally not included). Official Symantec WinFax PRO 10 CDs always displayed “WinFax PRO 10.0” or “Version 10.0” on the CD. The minor version was never displayed on the CD since Symantec would use the same front image for the pressed CD. Using one of these CDs for your installation of WinFax PRO is not recommended. NOTE: 10.04 update was not released on a CD ROM as a full installation or as a patch file. If your version of WinFax includes a copy of a 10.04 updater on the same CD ROM, beware, you are not in possession of an original Symantec software CD.